If you're a case sensitive fascist, frYars is probably not for you. But if you can look past the ludicrous capitalisation of this Patrick Wolf-meets-Bat For Lashes electronic outfit, then you will enjoy the wonderful sounds technology these days can make. In fact, it is quite remarkable how one bloke can construct such dulcet tones simply from a computer and keyboard, as shown by the BBC 6Music Session I am about to share with you all. 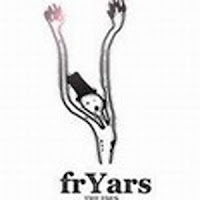 frYars is the brainchild of London teenager Ben Garrett, one of a clutch of talented youngsters in our fair capital. He's teamed up with the likes of Bombay Bicycle Club and Cajun Dance Party, as well as ex-Ladyfuzz drummer and now solo artist, Esser. Esser's pretty good too by the way. Oh and the producer of the recent frYars EP was none other than ex-Clor man, Luke Smith. And while we're here, R.I.P Clor and Ladyfuzz, two London bands that had much more in them than simply one album each. The tracks he played for the recent session were 'Horse Or Man', 'Madeline' and 'The Ides', which is also incidentally the title of his critically acclaimed EP (even Pitchfork were fans!). Aside from your enjoyment of the juxtaposition of strings and electronica, you might notice how atmospheric his music is; if a "pop" career doesn't work out then he'd be great at making meditational relaxation backing tracks. As with all offbeat artists, I have no idea what his lyrics are really about but who cares? These tracks are fantastic. frYars is also playing a couple of live dates at the end of November in London, which could quite possibly be his first ever ones. Check his [MySpace] for more details on those dates and how to buy his EP, which is available on iTunes and from independent record stores.